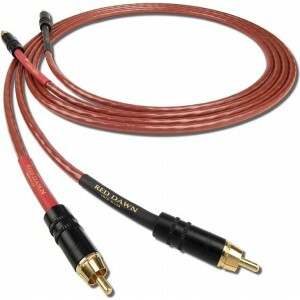 Nordost Leif Red Dawn RCA interconnects are fully-shielded cables that deliver high end performance at a modest price, which can be used with one unit or use several for your complete system. The cables a made from six, heavy-gauge 24 AWG, silver-plated 99.9999% OFC solid-core conductors, which is significantly more than the four used in the Leif Blue Heaven. The Leif Red Dawn use a minimum cross-section configuration, which means they eliminate unnecessary fillering or padding. The insulation is chosen for its superb dielectric performance, which is high-grade FEP. Also, the low-mass connectors and differential grounding are chosen for the acoustic performance capabilities. The Leif Red Dawn interconnect, like all Nordost cables, have the complete manufacturing and terminations done in the USA, which enables Nordost to always guarantee quality. Leif Red Dawn is a fast-paced, low-loss interconnect that entirely retains the feel of dynamism, speed, spectrum and drama, delivering your recordings both the intracacies and impact compellingly as required. Once you listen to your system with Leif Red Dawn interconnects you will be blown away by the vitality that they bring to your music. We also sell Leif Red Dawn terminated XLR-XLR. Please call us if you need advice on which option will suit your equipment.